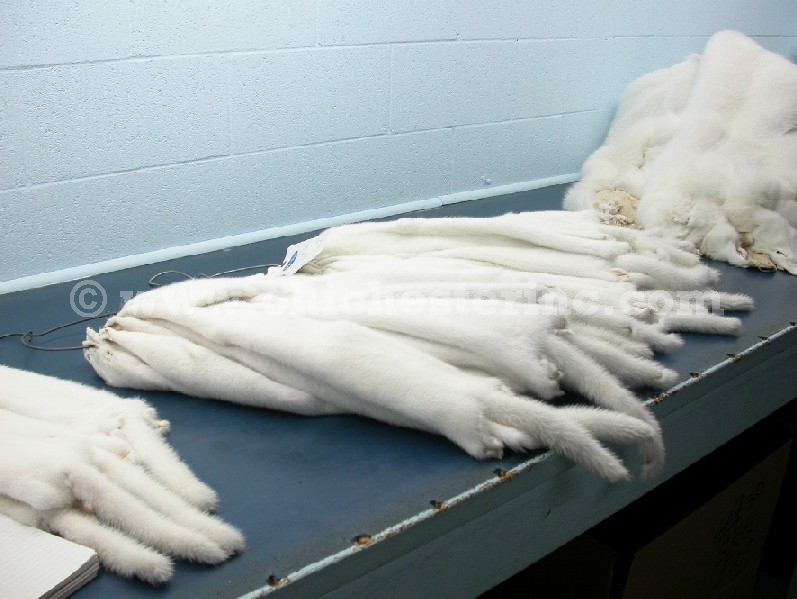 We offer a wide range of fashion quality mink skins and maintain limited stocks in our warehouse in Niagara Falls, New York. Large quantities can be transferred from Canada on our monthly shipments to the U.S. We also have some wild mink and craft mink. The female skins are approximately 31" from the tip of the nose to the tip of the tail in overall length. Useable length is 21" long from the ears to the base of the tail and 2.5" wide at the top and about 4" wide at the bottom. The tail is about 7" long. The skins come cased (like a sausage). When cut open, they are about twice as wide. All skins are natural colors. See color chart below. The male skins are generally larger than the female skins. They are good quality with weak spots, and may come with or without tails. They are not craft quality or fashion quality but somewhere in between. Male skins tend to have longer hair, denser under fur, and thicker skins than the female ones. The skins are approximately 32" to 33" from the tip of the nose to the base of the tail (not including the length of the tail). Useable length is 24" long and 3" wide at the top to 6" wide at the bottom. The skins come cased (like a sausage) and have tails that are about 12" long. They weigh about 0.40 pounds. When cut open, they are about twice as wide. Please note that sizes will vary a little. The mink with feet are 16" to 18" long from the nose to the base of tail. They are approximately 3" to 5" wide and are cased. The craft mink range in size from 16" to 24" long. Some are cased and some are open. Other colors available on a custom-order basis. Please allow a few weeks for us to clear these into the U.S. Overseas orders can be shipped quickly from Canada. 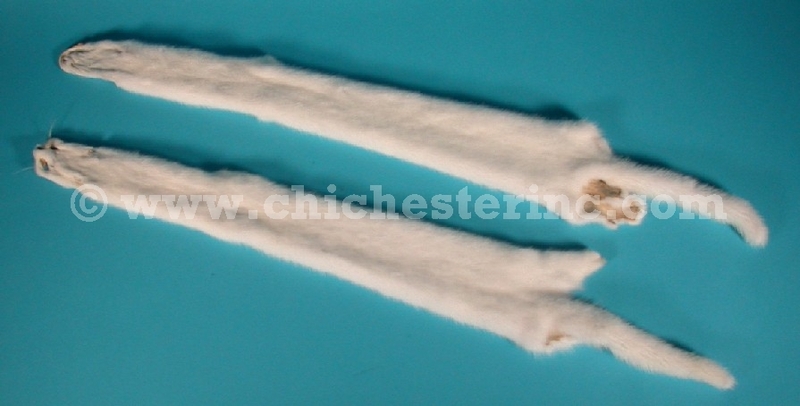 The male mink skins, 28-M-WH, are not for export outside of the USA. The above video is of the white male mink skins. Pearl Mink - These are kind of an off-white. Pastel Mink - These range from light brown to dark brown. Blue Iris Mink - These range from a light gray to a darker gray but tend to be darker and more gray than the Sapphire. Sapphire Mink - These range from light gray to a darker gray but tend to be lighter and more blue than the Blue Iris. Demi-Buff - These are slightly darker than the pastels and are more brown. Dark Ranch - These are even darker than the mahogany mink. They are not black. See the back side and a comparison with an 18"ruler. 1) What is the difference between White Mink and Pearl Mink? The Pearl Mink have a slight tan color to them. 2) What is the difference between a male mink and a female mink? The male mink tend to be quite a bit larger than the female ones.